Pears, pears, pears! I’ve overrun with pears thanks to my CSA shares this fall. They have been absolutely delicious but more than I can eat. This recipe was simple and resulted in a moist, delicious bread great for a breakfast treat with a cup of hot coffee, tea or hot chocolate. Due to family tastes, I omitted the nuts, but it would be delicious with walnuts or pecans! In a bowl, combine the eggs, sugar, oil and vanilla; mix well. Combine flour, baking powder, cinnamon, baking soda and salt; stir into the egg mixture just until moistened. Toss pears with lemon juice. Stir pears and walnuts into batter (batter will be thick). Spoon into two greased 9-in. x 5-in. loaf pans. Bake at 350° for 55-60 minutes or until a toothpick inserted near the center comes out clean. Cool for 10 minutes before removing from pans to wire racks. Yield: 2 loaves. Sour cherries in coffee cake sounded perfect given the wonderful frozen pie cherries in my freezer. I did not have a recipe for a cherry coffee cake but was delighted to find this recipe. Perfect for a Sunday brunch and perhaps leftover for breakfast during the week. Make the cakes: Whisk together flour, baking powder, and salt in a bowl. With a mixer, cream butter and granulated sugar in another bowl until pale and fluffy. Beat in eggs and vanilla. Working in alternating batches, add flour mixture and buttermilk, beginning and ending with flour mixture. Beat until just combined. Pour into prepared dish, and smooth with a spatula. Dot top with cherries, and sprinkle with crumb topping. Bake until golden and a tester inserted into center comes out clean, about 1 hour. (Note from Cathy: My oven tends to bake hot so about 50 minutes worked for me). Let cool before serving. Cheesy Sausage Grits…MMMM, MMMM, Good! Grits and Cathy did not have the opportunity to meet until about 8 years ago when I tasted a Grits Breakfast dish at a party. They actually tasted good and weren’t just a mushy, bland bowl of nothing like I expected. Of course, what doesn’t taste good when mixed with cheese and sausage? A few weeks ago I bought a bag of grits at Sprouts before I found a recipe for this yummy dish for my annual Mother’s Coffee/Tea. Every recipe I came across called for ‘instant grits’ not just plain old grits. After much searching, I found this recipe. As one Southern friend told me, instant grits aren’t as good so don’t even bother! Grits are now like a dear, old friend (at least when cheese is involved). I plan to make this again, without the sausage, as a side dish for BBQ. MMMM, MMMM, good! Saute the sausage and onions, breaking the sausage into small pieces. Drain the grease from the sausage and onions. Add the chilies, butter, eggs, cheese and Tabasco to the cooked grits. Combine the sausage and onions with the grits mixture. Pour everything into a 9″x 13″ casserole and garnish with the paprika and parsley. The mixture can be refrigerated for up to two days before baking (bring to room temperature before baking to use the same bake time). Bake at 325°F for one (1) hour. Banana Bread with Banana Jam…double the flavor! 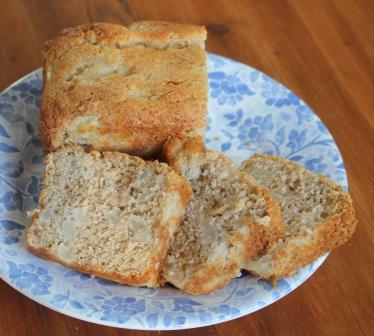 Banana Bread is an old time favorite that my Mother and the women before her made for their families. I like it plain, with a little butter, but always shared with family and friends. This time I decided to try it with the Banana Jam we drooled over in Nicaragua and I wasn’t disappointed (click Banana Jam link for recipe). This combination is great for breakfast, coffee, or dessert. Just say BANANA! Sift together 2 cups flour, baking soda, cinnamon, salt and nutmeg. Cream together shortening and sugar. Blend in eggs and vanilla; mix well. Add dry ingredients alternately with bananas, mixing just until blended. Combine pecans and 1 tsp. flour; stir into batter. Pour into greased 9″ tube pan. Bake in 350 degree oven for 45-50 minutes or until bread tests done. Cool in pan on rack 10 minutes. Remove from pan; cool on rack. Fresh fruit…pies, cakes, coffee cakes or naked is my favorite dessert or breakfast treat. This recipe, from Southern Living, caught my eye and with more beautiful peaches and a box of fresh blackberries, I had to try it. My oven bakes a little hot, so the bottom is quite brown but still delicious. This recipe will stay in my recipe box and perhaps a straight peach coffee cake will be in the plan for next summer! Beat butter at medium speed with an electric mixer until creamy; gradually add granulated sugar and brown sugar, beating well. Add flour, cinnamon, and nutmeg; beat just until blended. Combine flour, baking powder, and salt; add to butter mixture alternately with milk, beginning and ending with flour mixture. Beat at low speed until blended after each addition. Stir in vanilla. Pour batter into a greased and floured 9-inch springform pan (I used a small oblong pyrex baking dish). Top with sliced peaches and blackberries. Pinch off 1-inch pieces of Streusel Topping, and drop over fruit. Remember when we used to have a plain cup of coffee brewed in our Mr. Coffee machine or percolator? Coffee was typically Folgers, always hot, and if it cooled, you nuked it in the microwave. God forbid, I would EVER drink iced coffee, or so I thought. Ordering a coffee was far beyond the typical ‘I’ll have a cup of coffee, black to go’. Now there were terms like tall, grande, venti, Americano, espresso, skinny, Macciato, half-caf, blends, etc., etc., etc.. It was an anxious moment when I tried to figure out what to order without embarrassing myself. I can still imagine the people in line behind me rolling their eyes at this out-of-state novice. Despite my initial fumbling, I started experimenting with difference blends, flavors, iced coffees and loved it! My second perception occurred when I traveled to Finca Esperanza Verde, a coffee plantation in Nicaragua, in 2012. My ‘cup of Joe’ would never be the same as documented in my 6/12/12 Fork-Lore post. My daily iced latte is simple: One packet of Starbuck’s Via, a packet of Stevia with 1/2 cup of boiling water. Stir. Add cold water to the cup, stir. Pour contents over a large glass full of ice. Top with about 1/4 cup of Almond Milk and stir again. Add a splash of vanilla or cinnamon to taste. My easy version of an Iced Latte! When my daughter and fellow blogger, Megan, asked me to join her to make Iced Vanilla Latte I jumped at the chance to 1) spend time with my daughter and 2) make (and drink!) my favorite summer morning picker-upper. Our recipe follows and I’ve enjoyed our creation for the past two days. Megan’s blog, Lifeloveandgarlic, also features the Iced Vanilla Latte AND includes a Seattle’s Best give-away. Check it out and perhaps you’ll win The Hot Iced Giveaway noted at the end of this post. 1.) Fill your cup (or fancy tumbler) with coffee ice cubes. 3.) Fill the rest of the cup with your coffee of choice. Stir! 4.) Voila! Enjoy a delicious, easy and perfect drink for summer mornings. *This is the simple syrup, which actually looks sort of like coffee. The brown sugar + vanilla give it the darker hue. 1.) Put both sugars, water and pinch of cinnamon in a pot over medium heat. Bring to boil. 2.) Pull the pot off the stove and pour the vanilla into the syrup. Allow to cool. You’re done! Note: Don’t be alarmed that your syrup is quite dark in hue (almost coffee colored). The brown sugar/vanilla have that effect – it’s perfectly normal. Take your left over coffee and pour it in your ice cube tray and freeze! They’re perfect for cooling down your coffee without watering it down! And, you know the best part — A GIVEAWAY!!. Find out how to enter the contest by visiting: Lifeloveandgarlic.com and entering by 10:00 PM MST on July 24, 2013! Cranberry Coffee Cake for brunch, lunch, anytime! Cranberry Coffee Cake is a new recipe that my sister-in-law, Donna, shared with me several weeks ago. The Mother’s Day weekend coffee/tea was a great time to try it. The cake is so moist and the extra treat of cranberry is so good. I chose to go without nuts this time but the glaze was a wonderful touch. This coffee cake is wonderful anytime of year but could be a wonderful addition to your holiday go-to-recipes. In a mixing bowl, cream butter and sugar. Add eggs; mix well. Combine flour, baking powder, baking soda and salt; add to creamed mixture alternately with sour cream. Add extract. Spoon a third of the batter into a tube or bundt pan. Top with a third of the cranberry sauce. Repeat layers twice. Sprinkle with walnuts (optional). Bake for 55-60 minutes until a toothpick inserted hear the center comes out clean. Allow cake to cool and transfer to serving plate. Optional: Combine glaze ingredients and drizzle over cake. 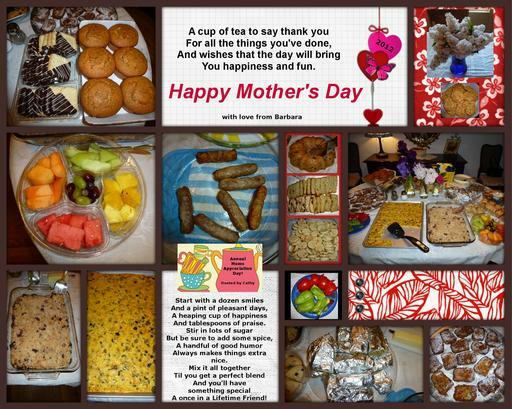 Mother’s Day 2013 will be a weekend of celebration starting with my annual Mother’s Day Coffee/Tea on Saturday. There will be much laughter, hugging, catching up and, of course, delicious treats. This year our friend Barbara has designed T-shirts to celebrate our annual event. 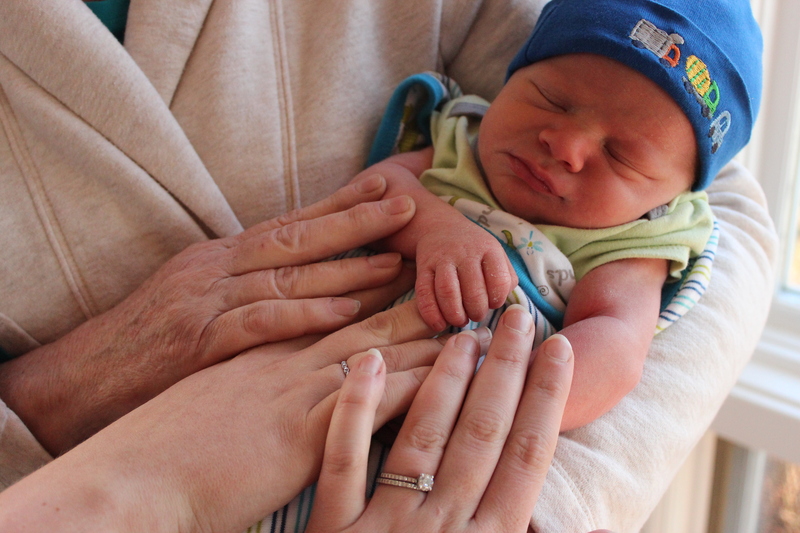 Sunday, our family will share a meal celebrating daughter Sarah as a Mother and now adding Grandma to my title. We are blessed. As I reflect on Mother’s Day, I think about my Mother who passed away in 2001. I miss her every day. How many times have I wished that I could pick up the phone and talk to her! Our journey as Daughters and then Mothers (and now Grandmothers) takes many twists and turns. I recently read this poem which reminds me of my Mother being there to support me and my own journey as a Mother. And the journey continues with my daughters. Love you, Mom. Love you girls! Pear Cake made with seasonal pears is a true treat. This recipe, from http://www.usapear.com was a great find and delicious as a morning coffee treat or as a seasonal dessert. Preheat oven to 350 degrees. Grease a round baking pan with 2 tablespoons of butter. Sprinkle with brown sugar. Brush the pear wedges with lemon juice and arrange in the bottom of the baking pan. Combine flour with baking powder, salt and cinnamon, Set aside. Using a mixer, beat the remaining butter with sugar until fluffy. Stir in eggs and vanilla. Add flour mixture and milk alternating the ingredients slowly. Continue to beat on low-speed after each addition. Spoon batter evenly over pears in pan. Cool before inverting onto serving platter. Decorate with walnuts or serve with whipped cream as coffee cake or dessert.